Most recently, I shared the biblical perspective of handling trials. You can read it here. Now let me be honest. While those deepest and darkest trials we may face should not annihilate our faith, can’t we be true with our God and admit that maybe our confidence can be shaken and bruised a little? Say maybe that my spouse is enduring a great physical trial, does my Heavenly Father expect me to be so ironclad regarding James’ words that I come across as one who merely accepts everything that happens to all as God’s sovereign will? Doesn’t that open the door to look really cold-hearted toward the ones we love so much? My mind can’t help but entertain… “Cheer up, Honey! Everything is going just as planned!” …a flower vase spiraling toward my forehead. 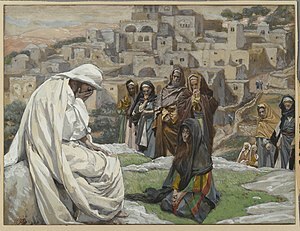 Why did Jesus weep? He knew what He was about to do! There was no doubt in His mind that Lazarus would soon be shucking and jiving with Him and the rest of the gang. So why did He cry? Is it maybe because love and compassion should never be trumped by sovereignty? It is a great comfort for me to know that our God has everything under control. It is an equally great comfort for me to know that Jesus’ compassion is great enough to weep during His friend’s trials. Lord, let His mind and heart be in me also. This entry was posted in WordPosts and tagged Christianity, compassion for the hurting, does God care that we're hurting, Jesus wept, Lazarus, Losing my religion, loving those in need, Religion and Spirituality. Bookmark the permalink. That was so beautiful I wept. Thank you Mike. You are a diamond of great value in God’s eyes. Thank you, good friend! In the midst of our trials, our God is ever good and faithful! May His blessings be upon your life this day and always! Thank you very much good friend! You are truly a great encouragement! God DOES have everything under control, and He knows the end from the beginning. He only wants the VERY best for us and we can have absolute confidence in Him. Amen, good friend! Thanks. God bless. The verse “Jesus wept” becomes something to hold on to during trials. I first understood that verse personally as I watched my dad die from cancer last year. Oh, and for the first time I really studied the book of Job and felt like we were walked through that story with new eyes and a new heart for the suffering. The Lord is good, and sufficient, and everything we need He has given us in the word and the Holy Spirit, our Comforter who can make us go through incredible pain and come out with a stronger faith in God than before. That is in itself a miracle. That’s a great testimony to the goodness of our Lord, friend! Thanks and God bless. Thanks for stopping in Carley! God bless, good friend.